Cold; a very annoying feeling of discomfort. When you need to get out of your warm bed in the morning, when you need to go outside into the freezing weather, cold is the thing that is keeping you back. We get very uncomfortable at cold temperatures. We dress ourselves warm as possible, we always heat the room to decrease the discomfort of cold. Is there any way to stop this feeling of discomfort? Could we stop feeling cold by changing our perception of cold? And if we could stop feeling cold, how does our body respond to that, wouldn’t we die without knowing? This winter I answered all these questions. To have the feeling of cold often, I decided to face the cold very often. Therefore, I tried to survive a Dutch winter in a t-shirt. From the Autumn until the Spring I wore only a t-shirt, no sweater, no jacket (I did wear pants though). Snow was falling, ice was cracking, but I survived. Justin, don’t be so cocky; it’s just the Netherlands not Alaska! And stop lying, you wore a sweater twice! Yep that is right, the average temperature this winter was 7 °C (45 °F) and I wore a sweater twice. Still, it was cold and people stared at me frequently, sometimes trying to lend their scarves to me. But I refused; I felt an increasing love for the cold winter. In October I stopped wearing a jacket, which did not feel like a big enough challenge. Therefore, I also stopped wearing a sweater and stopped using the heating (when I was alone). Furthermore, overtime I took cold showers, did some winter swimming in lakes, participated in an icebath session and always exercised outside in my shorts. Those are all activities which suddenly raised my interests this winter. How did I become a cold-loving-freak? How did I do that, and what did I learn? The first thing I did was trying to change my bodily responses to the cold. If you change your bodily responses, it might influence your psychological response in time. Before I started this experiment my body responded to the cold with fear. If you face (intense) cold you have several physiological responses, and you can control some of them. Your shoulder muscles tighten up, you hold your breath, and after a while you start to shiver and you get goose bumps. Tightening your shoulder muscles and holding your breath are responses you can control. Whenever you face the cold, just loosen your shoulder muscles and keep breathing. That is what I did, and I experienced less cold. You might try doing this under a cold shower. I also tried to tell myself to stop shivering whenever I felt like shivering. However, I am not sure if this actually worked , as after my icebath session I couldn’t control my shivering and I could not avoid getting goose bumps. The second tactic I used was perseverance. Your fingers don’t starve immediately when they feel extreme cold. Your body has a pretty advanced system working against it, which is called Cold-Induced-Vaso-Dilatation (CIVD). When you face cold, your body is trying to protect your core temperature. At first, the veins in your fingers close in order to protect your core temperature, therefore your fingers might hurt. However, when your fingers get too cold and your core is warm enough, the veins in your fingers will open again warming them up and preventing them from freezing/starving. Most of us have some extra reserves in our body (fat & glycogen) in order to keep this process running for a while. As the weather conditions in the Netherlands are not that extreme our internal heating system is strong enough to keep up with these external weather conditions. The third tactic I used was altering my internal heating system by exercising or breathing (Wim Hof method). Exercising was the trick in some situations. This winter I cycled often outside in t-shirts and shorts, I was cycling fast in order to generate more body heat. If you do this, you won’t feel cold, easy peasy. To examine my bodily responses I analyzed my daily average heart rate and skin temperature of this winter without a jacket (2015-2016) using my Mybasis B1 healthwatch data (N=126 (126 days)) and compared it to my data of the winter of 2014-2015, where I did wear jackets and sweaters (N=122). Furthermore, I used my (subjective) feeling of health, and activity pattern scores (scale 1-10) of my daily quantitative diary (N=157). For analyzing the effects on my eating behavior, I analyzed my daily calorie, fat, carbs, and protein intake, using my Myfitnesspal data (N=103). For all variables, I excluded “Holiday-data” because they were anomalies compared to my normal data. In SPSS 22 and excel 2007 I analyzed and plotted the data for further insights. So, with time I was able to change my perception of the cold. I made some psychological adjustments to get me through the cold. This has already helped me a lot with getting out of my warm bed, and my ability to relax in a (seemingly) cold room. It also helped me with going outside in snow, rain, and freezing temperatures without that much concern. Changing my perception is fine, but how did my body respond to the cold? As you can see in the next graph, the cold reduced my heart rate to an average of 58.5 bpm between October and March. While my heart rate during a normal winter was 60.0 bpm on average, T(246)=2.98, p=0.003. This winter, my skin temperature was also lower (30. 9 ͦC) than during a normal winter (31.4), T(246)=4.67, p<0.001. Over the months it seemed that the differences between my heart rates and skin temperatures did not change. That means that my heart rate and skin temperature did not adapt to the external weather conditions. My body needed to stay warm this winter, therefore I had to generate heat myself. This resulted in weight loss. In the next graph you can see that I lost about three kilo in four months. I did not change my activity pattern over the winter and I did not change my calorie-intake (see next paragraph). Wearing no jacket is therefore a very easy and efficient way to lose weight without the need to change your daily pattern. You don’t have to exercise more or eat less, you just need to face the cold (which might not be that easy). I did not change my calorie intake this winter, but I definitely had an urge to eat more fatty food. I started to eat a lot of nuts and I had an increasing love for fried food. 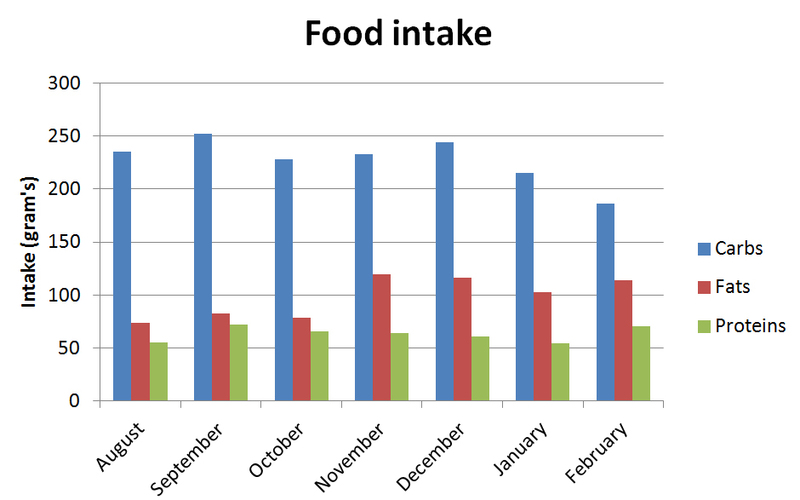 In the next figure it is clearly visible that my fat intake is much higher in the months without a jacket (October-February) compared to the months before. In compensation I reduced my carb-intake these months. Although I still had fat stored on my body (my BMI was 21.7), my body was craving for fat. Might there be some unconscious preventive mechanism which is afraid of fat loss? If there is, this could explain why people have much trouble with losing weight. This definitely needs more research. Influence of cold on health? Many people presume that going outside without a jacket will make you ill. However, I proved (for myself) it doesn’t. 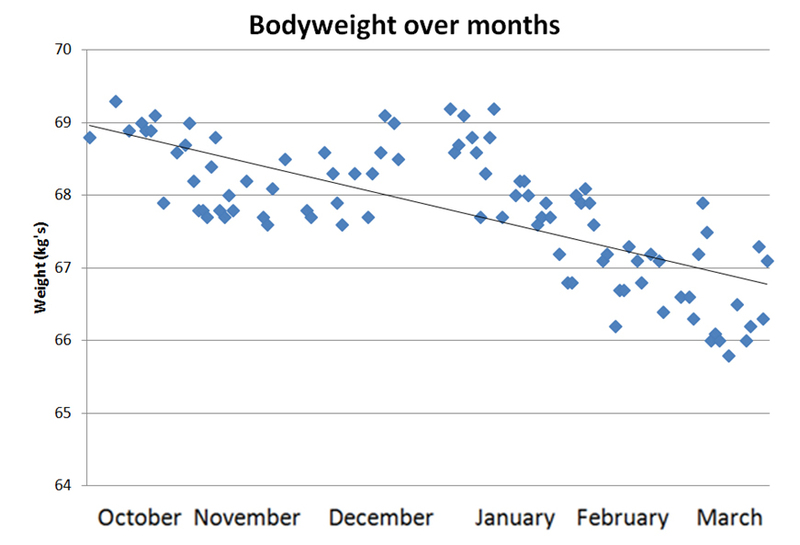 My subjective health score was higher this winter (5.76) compared to last winter (5.49), T(277.8)=-12.49, p=0.015. 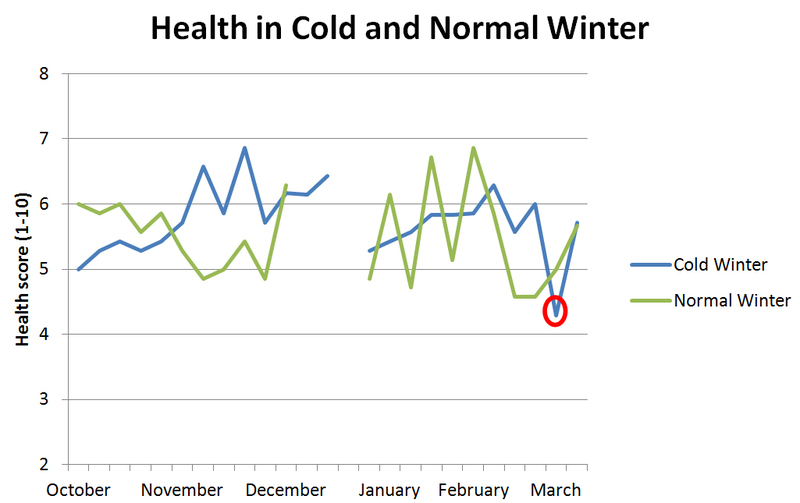 The first month of experiencing the cold I had an increasing feeling of health, however this feeling declined over the months (see the next graph). Unfortunately, I got ill for a few days in March due to a virus (the red circle in the graph). I hoped my immune system was functioning better due to the experiment, but this illness somewhat proved that it did not. Most of all, it is important to note that this experiment proved that going outside without a jacket does not make you ill. Nevertheless, it is also unclear to me if this experiment made me healthier either. I started to love and accepting the cold much more this winter. It is certainly possible to change your perception of how annoying cold is. Today, I see the cold more as refreshing. By consciously changing your physiological responses to cold you can change your mind. Personally, I think this is a very interesting finding. Nonetheless, it seems that my body did not adapt to the cold during the winter. 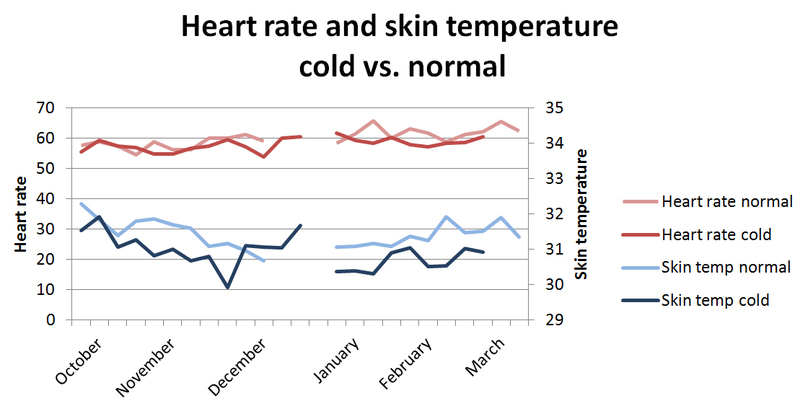 All winter, my heart rate and my skin temperature were lower than last year. My body just started generating heat from my fat reserves. The extra work of my internal heating system resulted in a loss of weight. Therefore, my internal heating system screamed for fats. I complied with that, but still lost weight. I felt a little healthier this winter, but I wasn’t king, I got ill once. Altogether, the most interesting thing I have learned is the connection between body and mind. This experiment did show that by changing bodily automatic responses to cold you can change your mind to reduce the feeling of cold. Nonetheless, this also worked the other way around; the loss of fat from my body caused my mind to crave for more fatty foods. In western medical sciences, we never learned that we can influence our body with our mind. However there are some very interesting cases proving that we can change do this. One fitting example is the practice of Tummo. With this meditation method it is possible to generate heat with your body just by meditating. The “Ice-man”, Wim Hof has applied this technique during his submersion in ice, bare-feet marathon in Finland, climb of the Mount Kilimanjaro in shorts and other crazy stuff. The mind-body connection offers a lot of interesting opportunities concerning health and health care. What about the perception of pain, exhaustion, or stress? What could this connection bring us in the future? Love this story. I also face winters in a (long-sleeved) T-shirt, out there. At home always wear shorts and short-sleeved T shirt. People think I’m kind of a crazy person for this, but I’ve learned to love the cold. My experience (I also wear a Basis, plus a Fitbit, a Withings and compile some more QS data on a daily basis) is similar to yours in most fields. Of course I also practice the custom of cold showers, but not for any weird ritual: I simply don’t use more than cold water at home at every occasion I need it, be it for showering, washing or the like. The same as I don’t heat my home (when alone, of course, because the rest of the world don’t find it so comfortable :-P) I really liked to know this experiment by your part. Thanks for sharing! I started taking cold showers since the beginning of the year, and oh boy, I love cold! It has helped me both physically and psychologically to overcome the previous feeling of being cold. This is just getting better, so keep loving the cold!